Larry Mitchell, "Character Animation with Poser Pro"
Discover how to bring your Poser characters to life with the latest version of Poser, the powerful 3D figure design software. "Character Animation with Poser Pro" shows animators, graphic artists, and game developers how to create high-quality, animated 3D characters, applying the fundamental principles and basic techniques of character animation to their favorite software. The book provides a clear introduction to themethods and workflows used to achieve believable character animation so that even beginners can design, pose, and mobilize their characters. You'll learn how to make your characters walk, run, and even lift objects, and how to integrate your animated character into the 3D host application Cinema 4D where you can model, texture, and render it. All the files needed to create the animations are included on the companion DVD, along with additional training tutorials to help you master character animation. 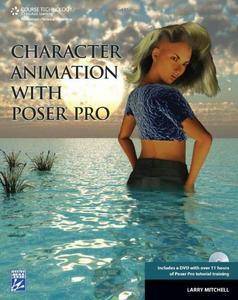 "Character Animation with Poser Pro" is an essential resource for Poser users who want to hone their 3D animation skills.